Mine is that I'm embarrassingly lazy with my skincare--give me the simplest regimen possible. I'm actually really low maintenance, almost to a fault. I'm a busy person with little time and patience for complicated skin products, but alas, I have problematic combination skin. What's a sometimes-oily, sometimes-dry, acne-prone girl to do? 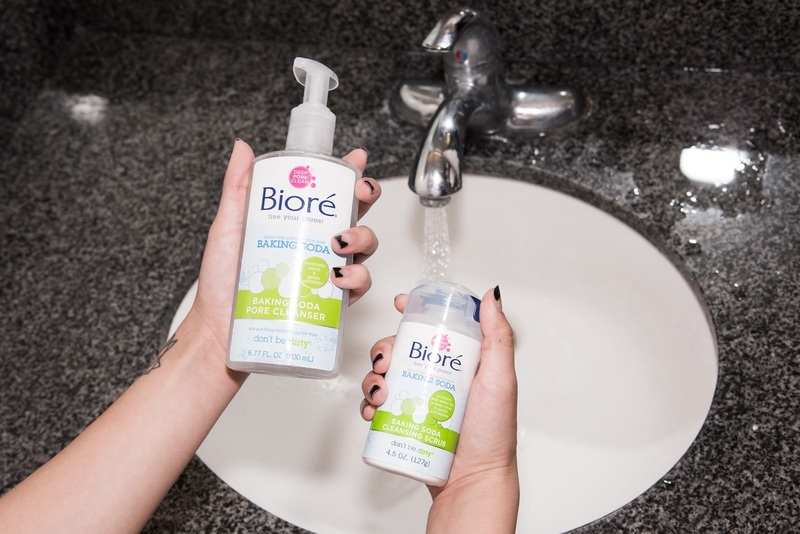 Introducing Bioré Baking Soda Pore Cleanser + Cleansing Scrub. These bad boys tackle all my issues, down to my pores. I've been anything but silent about my skin issues--I grew up with bad acne, and while it's gone away in my adulthood, I still get random zits and have transitioned from very oily skin to confusing combination skin. 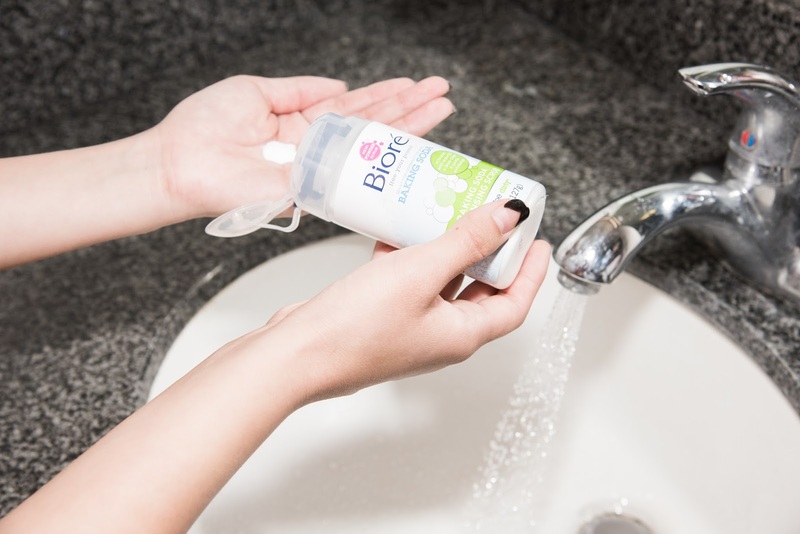 Bioré's Baking Soda Pore Cleanser is gentle enough for everyday use, deep-cleaning without overdrying (when your skin is dry, it overcompensates by producing even more sebum, meaning you'll have an even oilier face than when you started!). And then we have the Bioré Baking Soda Cleansing Scrub to exfoliate your face for smoother, cleaner skin. This baby arrives dry in a cool pop-top bottle, activating with water and naturally dissolving as you scrub to avoid over-scrubbing. You can add more water for a gentler scrub, or more product for a heavier duty scrub. These two are the only facial cleansers I've been using...and it doesn't hurt that they smell THE BEST ever. Click the links below to clean up your act, too. Love your hair color! Mine is purple and blue at the moment actually...sort of inspired by your amazing 'dos! Love your new beauty routine! wHAT u used to have lots of acne, too?? how does ur skin looks so perfect today?? shouldn't it be riddled with acne scars and regrets?? Great post! I myself am so lazy when it comes to my skin care! Thanks for sharing, may have to try these products myself! I just adore your pink hair! I can relate to being lazy about skincare... some nights, face cleansing wipes are my bff. Nice product for skin, women can take advantage this opportunity. I delight to see your products and your beauty, its really amazing. I just amazed to see this great stuff, it was more impressive and useful post for us. Thnaks for share that. I really like your opinion and your thoughts, it will be very useful post for me. Thanks so much for sharing this awesome info! I am looking forward to see more posts by you. Visit my site. Your DIRTY LITTLE SECRET blog is really good you also looking beautiful. Thanks for sharing with us. Its really great make up kit, i wanna buy this kit. Where i can buy that. You looking so pretty in this dress thanks for sharing your interesting post. Howdy, we found that we ought to have a site from where we can get speedy wage and can get fast money with no total what not. post a dedication of appreciation is all together to discuss.